Say Aloha to Great Hawaiian Luau Party Ideas! eBook Review! | Sahrish Adeel - Malaysia based Pakistani Beauty & Lifestyle Blogger! 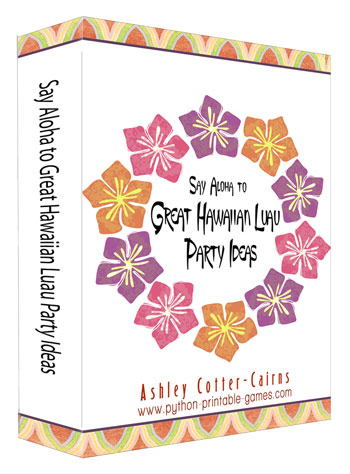 Say Aloha to Great Hawaiian Luau Party Ideas! eBook Review! Do you like to party with your favorite makeup look and attire on? YEAH? I got this great eBook to review, a few days back. As the title says, this book is about 'party ideas'. First thing I thought was: 'How I am gonna read it?' Because I am not someone who's very much into reading but when I went on with this book I could not stop and finished it sooner than I thought I would. By the time I finished reading it, I told my hubby that I want to throw a complete Hawaiian party, right this instance, in truly crazy Hawaiian-style! I know my blog is not about books or other disasters (LOL? ), But... When a book says 'come and party with your most crazy makeup and fashion attire on'... Could I dare say no? Oh, no, no! "A luau (in Hawaiian, lū‘au) is a Hawaiian feast. It may feature food, such as poi, kalua pig, poke, lomi salmon, opihi, haupia, and beer; and entertainment, such as Hawaiian music and hula. Among people from Hawaii, the concepts of "luau" and "party" are often blended, resulting in graduation luaus, wedding luaus, and birthday luaus." This eBook has really cute and colorful printable invitations that you can print and send to your friends & family. Hip, ain't it? You can get some great ideas for the decor and how you can create a Luau party in your back yard without spend much money. That's not all! You can get some really good recipes too for the cakes if you are going to have a birthday party or a wedding, based on this theme. You get to learn about the costumes for this specific party theme and trust me, the possibilities are endless. The coolest part of costume ideas is that it also has ideas for your pets. Now, little Tommy won't feel left out. When there is a party, there is food, and in a Luau-themed party, the food should be traditional Hawaiian. And, and, and. This eBook offers you some really cool party game that you can print and play. And if you subscribe to Python Printable Games, you will get more coupons and free games. This is the most amazing thing of this eBook and you won't even get bored with it. It is a bonus feature of this eBook that will keep you occupied even when you are not throwing a party and just having fun with your friendsfriends and family. This is the best part, my personal favorite, I tell you! This is a really nice eBook if you are a party peep or if you want to have a nice yet unique time just with your family. Cost: Oh? Em? Gee? Aaaaaaabsolutely free! This eBook is free to anybody who signs up to the Python Printable Games Newsletter. Note: This eBook has recipies that has alcohol or pork in them. So, if you don't want that in your food, you can always omit the alcohol and use mutton or beef instead of pork. Hope you enjoyed. Oh and don't forget to tell me how your Luau party went.